A simple source of single photons that is powered only by an electric current has been developed by an international team of researchers. The device, a modification of the traditional semiconductor p–n junction called a p–i–n junction, is made from diamond and is one of the first single-photon emitters to work at room temperature that does not need to be pumped with a laser – another research group working independently has demonstrated a similar device. In the short term, the device could help to make "unbreakable" quantum cryptography a more viable endeavour. In the longer term, the researchers hope the devices might open up new avenues for research in quantum computing and other research in quantum-information theory. Quantum cryptography allows two individuals, conventionally called Alice and Bob, to send a coded message while tracking any interception by an eavesdropper, usually called Eve. Information is encoded into quantum states – say the polarization of photons – and if Eve tries to secretly measure these states as they pass from Alice to Bob, then the laws of quantum mechanics ensure that Eve's actions are revealed to the correspondents. While quantum-cryptography schemes have already been used commercially, they rely on the production of single photons – which has proved to be a difficult thing to achieve. One way of doing it is using an extremely weak pulsed laser (in the femtowatt range). However, achieving a stable power output at this level is difficult. Some of the pulses will contain no photons at all, while others pulses could contain two or more photons. The latter is particularly unhelpful because if a pulse contains two or more identical photons, Eve could in principle measure the state of one photon while leaving the other untouched – and Alice and Bob would be blissfully unaware they are being bugged. For this reason, research groups all over the world are developing various schemes for producing reliable streams of single photons. Systems under investigation include those based on individual, self-assembled organic molecules or semiconductor quantum dots. Unfortunately, the most promising systems only work when cooled to cryogenic temperatures, which is not compatible with the commercial development of quantum-communication systems. An alternative approach that works at room temperature involves a crystal defect in diamond, called a nitrogen vacancy (NV). This occurs when a nitrogen atom replaces a carbon atom in the diamond lattice and a nearest-neighbour carbon atom is missing (the vacancy). NVs can emit single photons if excited by a laser of the right wavelength – a property called photoluminescence. However, this scheme is also seen as impractical because of the need for a bulky and expensive laser. In this latest work, Norikazu Mizuochi and colleagues at the Japan Science and Technology Agency in Saitama, together with international collaborators, have shown how an NV centre can be made to emit single photons by the application of an electric voltage – a process called electroluminescence. They did this by creating a light-emitting diode (LED) structure using doped diamond as the semiconductor material. The device consists of an undoped or "intrinsic" region of super-high-purity diamond that is sandwiched between p- and n-doped diamond layers. 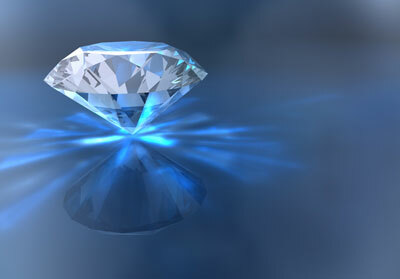 The super-high-purity diamond contains the NV centre. Mizuochi explains that, when electrons and holes are drawn into the intrinsic region by the applied voltage, they excite the nitrogen vacancy, thereby causing electroluminescence and the emission of single photons. Jean-Francois Roch of the Quantum and Molecular Photonics Laboratory in Paris, who was part of an independent team that developed a similar device using different methods in 2011, told physicsworld.com that this latest work is impressive. "To be honest," he says, "I must say that [Mizuochi's] group has done a more thorough analysis than the one we have done."